A garden railroad open house is what a recital is to a music student - an opportunity, not to show off, but to provide a sort of "status report" on your progress to interested parties. This year (2008) I am planning to have a "cold-weather" open house with a Christmas theme, my first ever. This will be the first of a series of notes on my progress and/or lack thereof. We'll start with a history of previous "open houses" on the New Boston and Donnels Creek." Note: Right now my only open house this winter is planned for November 8, from 1:00PM to 7:00PM. (Rain/Blizzard date is Nov. 15). If you would like to ask questions, learn more about our plans, sign up to come, sign up to help, or learn about other Christmas-themed open houses in Southwest Ohio this year please visit our 2008 Christmas Open Houses sheet. My railroad was only a year old when it was shown to about 70 family and friends at a daugher's graduation "open house," an experience that generated an article about letting kids set up accessories and run trains. In June of 2002, I had another open house, for participants in a National Garden Railway convention that was held in Cincinnati that year. We received a few visitors from all over the East Coast. In June of 2003, I had another graduation "open house" for friends and family of our second daughter, as well as a "club" open house in association with the Miami Valley Garden Railway Society. In November of 2003, I had my only cold-weather open house to date - it was associated with the NMRA train show in Dayton that month. Most of the visitors we received were from the East Coast - go figure. Although the trains were running and the buildings were still set out, most of the greenery was gone, so the railroad looked a little desolate compared to its summer months. Since then, I've added many more conifers and other evergreen plants, so the railroad still looks somewhat green all year long. In June of 2007, we had another graduation open house, this time to celebrate two daughters who had graduated college. Sadly, I had little time to prepare, and when I tried running my big, impressive trains, I realized that the roadbed had gotten too uneven to let them run. So we let the 0-4-0s and other small locomotives handle the chores. I then spent the rest of the summer trying to "fix" my railroad so I could run my big trains again. During that effort, I also realized that many of my buildings needed repair before they could be put on display again. The worst ones were the ones I had "trashbashed" from Fischer Price buildings. 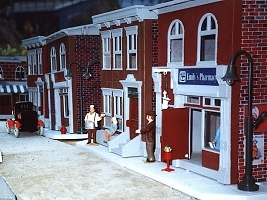 With realistic paint jobs and graphics, they had made up very credible city blocks in what I called "New Boston." In the intervening years, the plastic parts have held up very well (2-3 coats of all-weather paint have helped, of course). But the pressed wood and masonite parts have deteriorated to the point where some of them were no longer attractive or structurally strong enough to expose to the elements again. In the fall of 2007, I did attempt to repair some of my buildings, and to get others ready that I had been working on. I had two more sets of Fischer-Price houses that had not yet been "converted," so I experimented with removing the pressed wood panels from those buildings. Unfortunately, the plastic parts of those buildings did not take well to the pressure, and began snapping apart, a hint of what would happen to the buildings that have already been exposed to the weather. So I'll have to wait to work on my "converted" buildings until I have time and tools to do it right. Although the MVGRS had some spring open houses, we had conflicts with each weekend, so I could neither see nor hold a "club" open house this past spring. Even if I had, there was no chance that I would have been able to run the big long trains, or put most of my most unique buildings on display. So I decided to try a September open house. By May, it was obvious that September wasn't going to happen. By July it was apparent that October wasn't going to happen. So I thought about trying to schedule another open house in conjunction with the Dayton NMRA train show in November. This close to the holidays, I figured it was time to consider including a "holiday" theme. Fixing the Roadbed - Finally, I decided that it was time to "fix" the damaged roadbed once and for all by pulling out the affected track, digging a ditch, and pouring concrete underneath it. All of this would have been much easier to do back in 1998 when I first laid that track, than working around a mountain, and a pond and plants that I wanted to keep healthy. The story of that rework project is here. I then shimmied and reballasted the rest of the railroad and made certain at least some of my trains would run (a 4-4-2 and 2-8-2 have been running successfully on the mainline). Lighting Buildings - In 2007 I had experimented with using solar lighting on my railroad. In 2008, I tried a few more things. But I determined that solar lighting by itself wouldn't keep things brightly lit for long when days are short and cloudy. So I experimented with lighting buildings using a low-voltage garden lighting set. The results were promising. 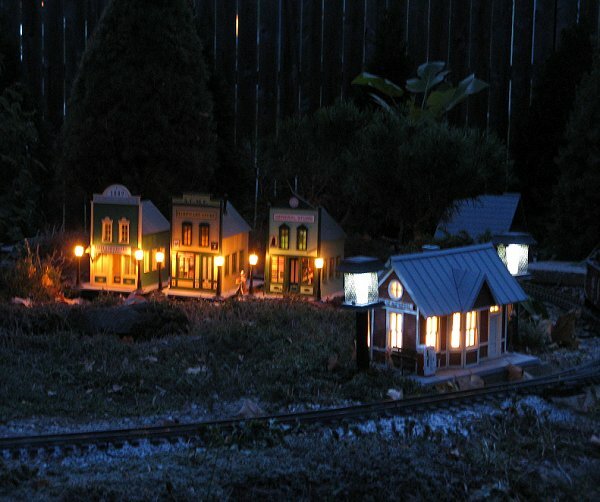 In fact, the combination of solar and low-voltage lights kind of make my railroad look like a Christmas village that is larger than my house. However, they also pointed out my need for more lighting and more buildings to provide the kind of interest that would keep Christmas-time visitors involved for more than a few minutes with my railroad. Help With Building Deficit - Providentially, an internet acquaintance, railfan, live steam fan, and sometime garden railroader, Louie Pittoli, advertised some of his buildings for sale on the Large Scale Central classified pages. Louie had not only assembled these buildings in a professional manner; he had also mounted them on plexiglass bases, added street lamps, and created a wiring network that would make them easy to install. Louis also lives within a few miles of my father, whom I was planning to visit in October anyway. The buildings are all Piko storefronts, representing late 1800s or western structures, not exactly the period or place I usually model. But they were very attractive, and the notion of having working street lamps on a twighlight or after-dark open house was appealing. On the trip to see Dad, I bought the three buildings that I thought would blend in with my other structures the best. I probably should have bought them all, but at this time of year, costs for operating Family Garden Trains™ and its associated web sites are high and income is low. (Bandwidth goes up, income stays flat). After setting the buildings out for a day to get an idea of where they might go, I took them inside and tested them out with a 12-volt DC power supply left over from an answering machine or something. They looked great. I figured out Louie's wiring system, took them outside and hooked them into my 12-volt low-voltage lighing system. Very nice. Now I sort of wish that I had bought them all . . . . Well, I may get back north eventually . . . Still to Go - Here are some things I'd like to get done in the next two weeks. What do you think? Running Christmas lights - We have inherited, literally, over a dozen strands of blue "twinkle" lights that might look nice around the arborvitas that mark the "back" border of our empire. I also probably have enough strands to run white or mixed lights on most of the conifers on the railroad proper. Time is another issue. Building Thomas' Railroad - Last year I built a portable Thomas the Tank Railroad as part of a series of garden railroading clinics for Holden Arboretum. I'd like to set that railroad up, too, especially if I have enough help to watch the kids as Thomas and James run. Of course that means more buildings and more lighting as well . . . . So all in all, there's not THAT much on my plate in the next week . . .
As we go through this process, we are getting things accomplished that we needed done whether or not we have a Christmas-themed open house. But when we started planning this project, we also felt that this would be an especially good year to give early Christmas cheer to our friends and family, to anyone who is able to attend, and to anyone who reads these blogs. If this has been an especially stressful year for you, you are probably hoping for this Christmas season to encourage you and to enrich you in all the ways that really count. Frankly, we feel the same way, which is one reason we keep trying to add to our reservoir of helpful and encouraging articles on our Family Christmas Online(tm) web site. The same hope for our families, friends, and readers is what started the "ball rolling" on our Christmas-themed open house project as well. In other words, if you take nothing else away from these articles, please accept the Race family's best wishes for a safe, happy, and blessed Christmas and New Year!